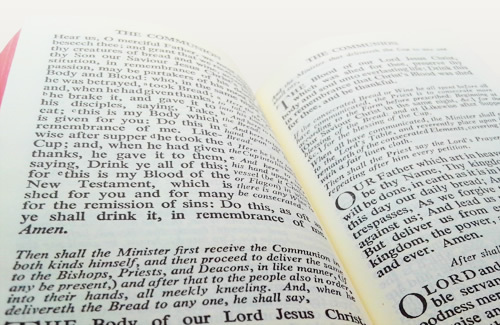 The Anglican faith is founded on the Bible. The Church has a deep theological grounding and carries a long tradition, a polity in the ministry of clergy, and a strong emphasis on liturgy, as all these are a part of the Anglican faith. The Bible, as "containing all things necessary to salvation", and as the rule and ultimate standard of faith. The Apostles' Creed, as a symbol of the baptismal covenant; and the Nicene Creed, as a proclamation of Christian faith. We believe in the Holy Spirit, the Lord, the giver of life, who proceeds from the Father and the Son. With the Father and the Son He is worshipped and glorified. He has spoken through the Prophets. We believe in one holy catholic and apostolic Church. We acknowledge one baptism for the forgiveness of sins. We look for the resurrection of the dead, and the life of the world to come. Amen. The historic Episcopacy, adapted in its administration by local practice to the needs of the Province, called by God into the unity of His Church. Baptism and Eucharist, the two Sacraments instituted by Christ Himself, are celebrated in accordance with His teaching. Other Sacraments: Confirmation, Reconciliation of a Penitent, Celebration and Blessing of a Marriage, Anointing of the sick and Ordination are administered whenever required. A Communion transcending differences in race, nationality, colour, gender, class, culture, background or time, in heaven or on earth, worshipping and sharing together. The Apostle St Peter is the rock of the Church. He laid hands on the bishops of early times to consecrate them. Such a practice is carried on with successors of this Holy Order as a tradition. By so doing, it is to affirm the lineage of succession with Christ's first chosen, and the Church is founded by Him. Anglicans are exposed to a rich variety of theological viewpoints, liturgical practices and social issues. And the multi-faceted development of the Church is largely dependent upon our high regard for and the good use of available resources. The Anglican churches treasure their tradition and continuously commit themselves to self-reflection and renewal. This Book is the legacy of Christians through many generations for the enrichment of spiritual meditation and public worship.